Go Bake or Go Home: Delicious Roasted Romanesco! Romanesco. What a striking vegetable! Take a look! It's so whimsical! Romanesco is an Italian member of the Brassica family. Which means that it's up there with cabbage, kale, cauliflower and broccoli. All so yummy and healthy too. It's very similar in taste and texture to broccoli and cauliflower. But it's actually a lot more easily digested! Yay, good news! Romanesco's spears are really easy to snap off - much less messy than broccoli or cauliflower! I bought mine about a week ago but just couldn't bring myself to eat it. I just wanted to stare at its beauty... but in the end... I decided to roast it! Yummy! It was well worth it. Roasted romanesco is just as delicious as roasted broccoli or cauliflower! And if you've never tried it, you must! The flavors are so completely different than when steamed or boiled! 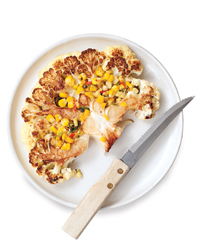 Slice 1 whole romanesco into quarters. Remove and discard leaves and stem. Snap off individual spears and cut them in half if they are too big so that they don't take forever to roast! Also, the smaller the pieces, the more surface area you will have to caramelize! Spread evenly on a parchment paper-lined baking sheet and drizzle lightly with about 2 Tbsp olive oil, toss. Bake for about 35-40 minutes and remove from oven. At this point, the spears should be tender when pierced with a sharp knife. Make sure to test the biggest spears, since they will take the longest to cook. Sprinkle with 2 tsp coarse sea salt, a pinch of fine sea salt, a couple turns of fresh ground pepper and 1/2 tsp dried garlic granules. Toss. Increase oven temperature to 450 degrees and bake for an additional 15 minutes or until the romanesco starts to caramelize and smell delicious! Wondering what else could make with this wonderful roasted vegetable? This would be delicious as a warm side dish along side beautiful red quinoa, added to a coconut chickpea curry or in a cold white bean salad seasoned with balsamic vinegar and fresh basil. Roasted Romanesco would also makes a delicious soup. Add some quick-cooking red lentils for protein. How about slicing into it into "steaks" and roasting it like they do in this recipe ? Have any of you ever prepared this amazing vegetable? ?